Southern cuisine. Soul food. Down home goodness. Call it what you will. When it’s time for a hearty plate of chicken and ribs with all the fixins, there’s a new homegrown outfit that will bring it —hot and fast— to your door. 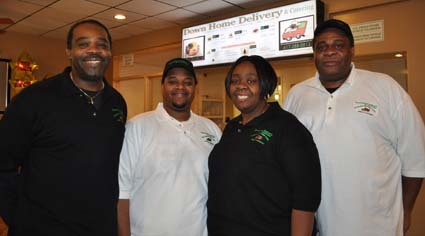 Down Home Delivery and Catering celebrated its grand opening in the heart of Four Corners last month. The Webster family of Dorchester launched the business last September out of a smaller space in Jamaica Plain, but has now expanded into far more spacious quarters at 2 Bowdoin Street, in the former home of City Fresh Foods. Gary Webster runs Down Home along with two of his brothers — Willie and Michael— and his sister Cynthia, along with son-in-law Daren Payne and Manny Mendes. Their concept is simple: The Websters churn out the staples of high-quality southern food, pack it up and bring it to your door for a reasonable price. The storefront includes a take-out counter, but no tables. Instead, the Down Home team has invested in a fleet of four vans that are constantly on the move in and around Boston. “We looked at why some of the really good places in the city didn’t last,” says Gary Webster, rattling off names like Poppa B’s, Bob the Chef’s, and other once-popular soul food havens that have closed their doors in recent years. The company started more modestly in September 2009— using space at the Sam Adams Brewery intended to incubate smaller food businesses. “It gave us the opportunity to hone the craft,” says Webster, who retired from a job with the Mass Water Resources Authority in 2009 to launch his dream business with his kin— including brother Willie, who spent decades cooking for institutions like Norwood Hospital and Boston College. The family— which has Tennessee roots— has always taken pride in their cooking prowess and lamented the many southern start-ups that have failed to get a permament foothold in the Boston market. There’s no such “fear factor” for the Webster clan. They all live in th neighborhood and stress that their decision to base their operation out of Four Corners was no accident. Down Home has opted to forego the lunch crowd and open their doors at 3 p.m. for the start of dinner. They also prepare larger, catered events, including a recent job at UMass-Boston for 600 people. No matter how fast Webster and company get it to customers’ doors— he knows that the one thing that will make or break Down Home is the quality of the food. “Our southern fried chicken is the best around,” Webster claims. The other highlights: baby back ribs, mac and cheese and pecan pie. “The southern tradition says that you have a hearty meal and then you have to enjoy some kind of dessert,” Webster said. Down Home Delivery and Catering is open for business Monday-Saturday and closed on Sunday.